Diving in cold waters demands a solid, high performance dry suit. And the ScubaPro Everdry 4 drysuit is marketed by the manufacturer as just that. The Scubapro Everdry 4 also comes with a changing mat bag, a hose and a repair kit. 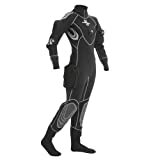 This drysuit is available in a range of men’s and women’s sizes. Relaxed and broad sizes are also suitable for those with larger frames. Bear in mind that the Everdry 4 is designed for a thin undersuit. Should you wish to wear thicker layers underneath, then get a larger size. Perhaps the only downside to this suit, based on reviews we’ve seen, is that those with particularly large feet might find the feet in the Everdry drysuit a little too cosy! Do you have this suit? If you already have the Scubapro Everdry 4 drysuit and you’d like to share your experiences and thoughts, give us a shout! We’d love to know how many dives you’ve completed in the suit and what you think so far. I’m a slight female. I bought this suit in August last year (it’s now December). Have done 38 dives in it so far. I love this suit! My last one was also Scubapro but membrane. This one is very warm (sometimes too warm while kitting up!) I can comfortably do an hour long dive in Scottish waters. Fits well (though I also had to buy a new undersuit to fit underneath, but it was worth it) and is comfortable to wear and move in. The only bit of DIY I’ve had to do so far is glue up some tears in the cuffs due to fingernails. Occasionally I get leaks in the wrist seal, but only due to movement, as I have small wrists anyway. Definitely recommend this suit in terms of warmth and comfort!